Digital signage is practically taking over the promotional scene of restaurants, food-joints, and eateries. Gone are the days of brightly painted billboards with giant donuts attached to them and overstuffed menu cards that were too difficult to understand. Digital signboards come with exciting new capabilities that can be used for much more than just displaying menus. Hence, businesses have started to see the value in this investment and are installing these signs and screens both in and outside their restaurants. An increasing number of restaurants have already reported a significant reduction in operational cost and improved ROI that they have achieved after the installation. Judging from the speed with which these signs are being used in eateries including fine dining chains and mid-sized diners, it can be safely said that the hospitality industry is not just classifying digital signage as a trend, but it is treating it as a step forward towards achieving operational efficiency and enhancing customer experience. 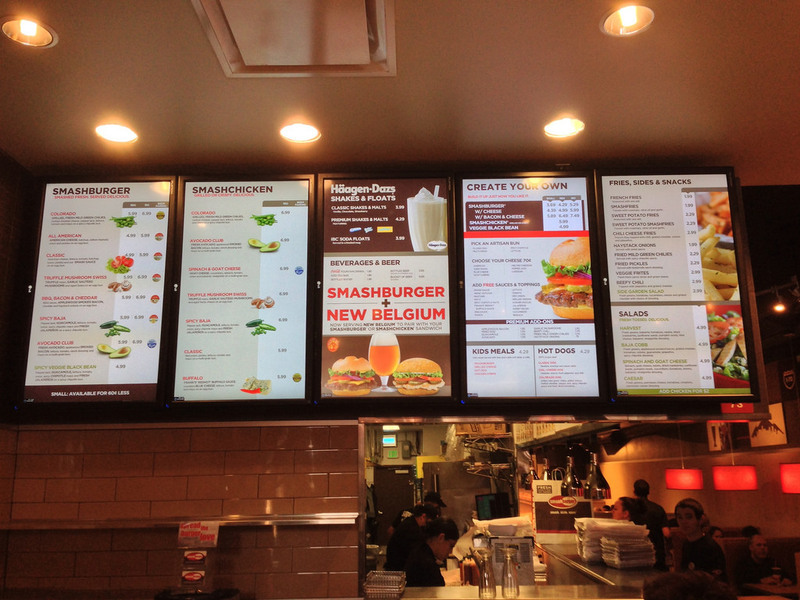 As a restaurant owner, you may be already aware of the benefits of installing digital signage. Reduction of operational costs, ease of updating menu without having to print new cards and paint new boards, and environment-friendly marketing are just some of them. However, there are multiple other ways in which these signs can boost your business profits that you may not be aware of. In that regard, let’s take a look at some of the best creative marketing possibilities that digital business signs menu boards extend. You can open up a whole new world of possibilities by using digital signage for advertising and sharing information. The federal law also states that restaurants and eateries must display the calorie information of the offered dishes. By providing the same through digital signs, you can grab the attention of the guests with nutritional info about the ingredients used, customer milestones and food preparation videos. Also, display updates on daily or seasonal specials, offers, deals and discounts on giant screens. This way, you can ensure that the information is getting conveyed. It is a proven fact that videos, music, and images work much better than text when it comes to communicating information and holding people's interest. Remember the overcrowded local pubs on game nights? You can leverage the digital signage technology to tell your story to the world. Run employee interviews, behind the stage preparation videos, videos about the journey of the restaurant, its traditions and heritage, and customer testimonial videos to keep your guests hooked on to the screens. It will also help your customers to know more about your brand. After business hours, the same displays can be used for training the staff. To celebrate a milestone, you can arrange for movie or game screening for your employees too. Today, social media is where the real crowd is. No matter where people are at any given time, they scroll through some social platform or other at least once a day. Restaurants can also allow their customers to access various social networking sites through the digital signage. You can do this by displaying QR codes on large screens that customers can scan to obtain information, deals, discounts and more. You can show the restaurant's Facebook page on the screens and encourage people to like it. Tweets and Instagram posts that guests make about the restaurant can be displayed on the screen as well. Also urge your guests to post reviews on specials, regular menu items, décor and service on review sites and social media. In the last few years, the digital signage industry has seen ample innovation, and experts say that exciting things still are in store for restaurant signs in the upcoming years. Practices will get more integrated, customer-oriented and comprehensive. Services will be faster, designs will be better, and the overall effect will be smarter and more fruitful. It is important to remember that this technology is built for people and around their experiences. It streamlines workflow, improves communication, increases engagement and helps to form communities. Thus, this technology should not be perceived as a necessary investment only for enhancing customer experiences; it is equally vital for making staff experiences better. After all, your staff is your asset, and you should pay as much attention to them as you do to your customers. Author bio: Karen Anthony is a marketer who has been working with various gourmet brands for years, helping them with both online and offline branding. She has written many blogs about the businesssigns menuboards that restaurants should use to grab and hold customers’ and staff’s attention. Her articles are equally popular with restaurateurs and food lovers.